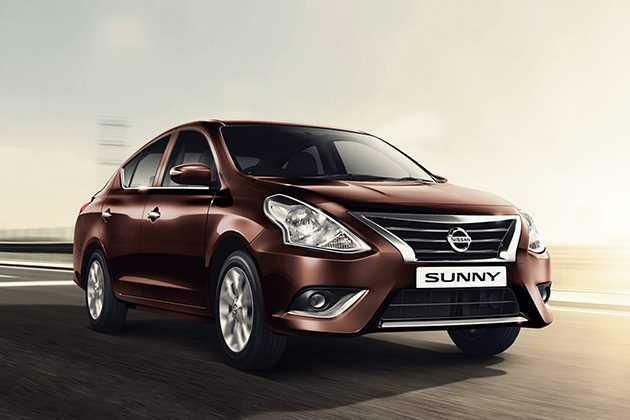 One of the most talked about vehicles, the 2014 Nissan Sunny sedan series has finally arrived in the Indian car bazaar. This time, the automaker has introduced the vehicle in eight variants (five diesel engines, three petrol trims). Among these, Nissan Sunny XL is the mid range petrol variant that comes equipped with a 1.5-litre, HR15 petrol mill, which is capable of producing 97.7bhp of peak power and 134Nm of commanding torque. The company has introduced this latest version with new exterior and interior aspects, which render it a trendy new look. To start with the exteriors, it comes with a slightly pronounced radiator grille along with a restructured headlight cluster. Also its bumper has been redesigned and is decorated with chrome inserts. Coming to the interiors, this latest version gets a refined greige color scheme along with a newly designed dashboard that gives a fresh new look to the cabin. The company is offering this variant with sophisticated aspects like a 2-DIN music system, an automatic AC unit, rear parking sensors and other top rated aspects. It is also bestowed with crucial safety aspects like driver airbag, ABS with EBD, and an engine immobilization unit. This sedan is now available in six exciting body paints including three new colors. The list includes Bronze Grey, Pearl White, Deep Grey, Blade Silver, Nightshade and Onyx Black. The exterior of this new sedan gets a major cosmetic update that gives it a modernistic look. The automaker has revamped the entire front profile, while giving minor tweaks to the side and rear facets. To start with its frontage, it comes with a modified headlight cluster that comes incorporated with powerful halogen lamps along with turn indicators. It surrounds a redesigned chrome radiator grille that is fitted with three expressive slats. The company has also updated the front bumper with a rugged design that features a large air dam and a pair of fog light consoles with chrome strips. Coming to the sides, it comes with restructured external wing mirrors that are painted in body color. The side facet also comes with features like body colored door handles and B pillars with black sash tape. Its wheel arches have been fitted with a set of 14-inch steel wheels . These rims are equipped with full wheel covers and have been covered with tubeless radial tyres. Its rear profile remains mostly identical to the outgoing trim. The only change is that the bumper is fitted with a black protective cladding, which gives it a trendy new look. The main highlight of the rear is its swept-back taillight cluster that has high intensity brake light, courtesy lamp and turn indicators. It surrounds a large tailgate, which is further equipped with a license plate console. Also, it has a stylish company's logo and model lettering, which are in chrome. This latest version is bestowed with a refined greige color scheme that creates a plush ambiance inside. It comes with a redesigned dashboard and central console, which are further equipped with a music system, an automatic AC unit and several other utility aspects . Its also has a drive computer that is equipped with a tachometer, speedometer and various other warning lights. This mid range trim comes with comfortable seats where the driver seat has height adjustable function while the rear seats have 60:40 split folding facility. These seats have been further incorporated with adjustable head restraints and are covered with good quality fabric upholstery. The company has equipped several utility based features like six cup holders, storage compartment, bottle holders and numerous other such aspects. The company is offering this latest sedan with the same 1.5-litre, HR15 petrol mill that is incorporated with an electronic fuel injection system. This mill has 4-cylinders each of which has 4-valves, which make a total displacement capacity of 1498cc . It has the ability to produce a maximum power of 97.7bhp at 6000rpm that results in a peak torque output of 134Nm at just 4000rpm. This mill is paired with a sophisticated 5-speed manual transmission gearbox that delivers the torque output to the front wheels. The company claims that the vehicle can produce a mileage of about 16.95 Kmpl (certified by ARAI). This sedan is bestowed with a robust suspension and highly proficient braking mechanism. Its front wheels have been fitted with conventional disc brakes, whereas its rear wheels have been equipped with solid drum brakes . This braking mechanism is assisted by anti lock braking system, brake assist and electronic brake force distribution, which keeps the vehicle agile even on slippery roads. As far as the suspension is concerned, it has McPherson strut fitted on its front axle and torsion beam system equipped to the rear axle. On the other hand, this latest sedan is also integrated with a responsive electric power assisted steering that supports a minimum turning radius of 5.3 meters. This Nissan Sunny XL is the mid range variant, but it is still equipped with several top rated features. It comes with an automatic air conditioning system that regulates the air temperature inside. It also comes with a list of features including power steering with tilt adjustment, 12V accessory power socket, headlight on warning lamp , front and rear power windows with driver's side auto up/down function, central door locking, boot lamp and other such aspects. In addition to these, it has follow-me-home headlamps, remote boot opener, remote key less entry and driver's seat height adjuster. Furthermore, the company is also offering a 2-DIN music system that supports CD/MP3 playback USB/AUX-In sockets and Bluetooth connectivity as well. The audio and call function buttons have been mounted on the steering wheel as well. The car maker is offering this mid range variant with several important safety aspects as standard like ABS, EBD and brake assist system . The list also includes aspects like driver airbag, door ajar warning lamp, speed sensing auto door lock, central door locking, key remove warning, low fuel notification, and headlamp on warning lamp. In addition to these, the company has installed anti theft device featuring an alarm and an engine immobilization unit, which protects the vehicle from theft or unauthorized entry. 1. Swanky new exteriors and interiors. 2. Engine performance is quite impressive. 1. Poor fuel economy is a disadvantage. 2. Cost of ownership can be more competitive.